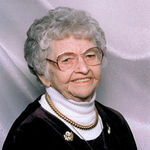 Mildred E. Herd of Miami, Oklahoma formerly of Picher, Oklahoma passed away Monday Dec. 6, 2010 at Higher Call Nursing Center in Quapaw, Oklahoma. the Nazarene Church in Picher, Oklahoma. She had worked at Picher School as a cook for 17 years. one daughter Joyce Farrar; and one brother Lensey Lane. 73 great-grandchildren and 26 great-great-grandchildren. Funeral services will be Thursday Dec. 9, 2010 at 2 p.m. at the Paul Thomas Funeral Home Commerce, Oklahoma. Pastor Herman Wood and Pastor Casey Hollingsworth will officiate. Pallbearers will be grandsons. Interment will be in G.A.R. Cemetery in Miami, Oklahoma.